New Season, New Puppies: Helpful Tips for Caring for Your New Pup - Richell USA Inc.
Spring is a time of new beginnings and playful puppies. Your bouncy new puppy is a work in progress, requiring lots of care and training, but the effort is worthwhile. Here are a some helpful ways you can shape good behavior early in your puppy’s life and get your housetraining under control, too. To help your puppy feel right at home, do some spring cleaning and get your pet’s area organized. All dogs like to have their own space to relax, eat, and sleep without interruption. Put all of your dog’s stuff like food, leash, collar, treats, and his dog house or bed in one area for ease of access. Speaking of his new home, ditch the rusty cage and make his confined area inviting with a new containment option from Richell USA. Our Convertible Elite Pet Gate is the top of the line and has an upscale look for your home. It converts from a secure pen with a walk-through gate to a freestanding gate to a room divider. It is also suitable for small to medium sized puppies and dogs. For economy and security, our Pet Training Kennel is a superb choice. Help your puppy embrace his personal space by tossing in a treat and chew toy. As a new pet parent, you should rotate time in and out of his space for short periods. Also, be sure his is exercised first and has a chance to eliminate. Our training kennel is also great for Feeding meals in this area too. This allows your puppy to associate his space with the good things in life. 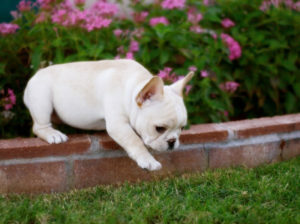 The puppy wants to be with you, so the confinement system you choose should be placed in the home near family activity. Another great tip on making your puppy feel at home is by remembering that he wants to be with you, so choose a confinement system that can easily be placed in the home near family activity. Your puppy will quickly tire of his toys if they are left on the floor. Keep just one or two out at a time, and use them to interact productively. Encourage retrieving skills by tossing the toy down a hallway. this gives the pup a narrow space with limited distractions. Praise him when he picks it up and clap your hands to encourage him to bring it to you. Remember to put the toy away before he tires of it and your puppy will be eager to play with it when you reintroduce it later. When storing your pup’s things, make sure you have a clean and organized system. Richell USA makes the Pet Stuff Tower which is great for maximizing the use of space for toys, dry food, treats, and even leashes and collars in one neat, compact location with a foot pedal for hands-free access. Housetraining Your Pet Inside or Out? Housetraining is a hot topic among new puppy owners. You can spend endless hours standing outside in all kinds of weather, hoping your puppy figures it out. Everyone offers their opinion, but how do you know what’s best for your newest family member? Training your puppy to eliminate outdoors can be a big stumbling block for new owners. Outdoor areas soiled by adult dogs may harbor illness and parasites which are real risks for puppies that are not yet fully vaccinated. Many times, our work and school schedules prevent us from taking the puppy out every two hours to eliminate. If you opt to housetrain inside, start with a safe, convenient program for housetraining indoors. You can even make housetraining easier by using PAW TRAX Doggy Pads to your puppy’s personal space. These super-absorbent pads can be used alone and won’t leak through to your floor. There's also our PAW TRAX Mesh Training Tray. 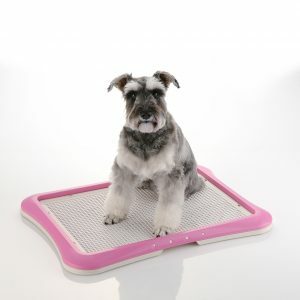 The Mesh Training Tray keeps the pad from slipping or corners folding up and enticing curious puppy teeth. Success will come faster if you are aware of when your puppy uses the pad, so stick close to him. Puppies need to eliminate as soon as ten minutes after drinking water, eating, waking from a nap, and sometimes during play. During these times, take him to his personal space and lead him to the pad. Choose a phrase to say, like ‘Hurry up’, and be consistent with it. If he uses the pad, give him lots of praise. He will connect your praise to his action and you will effectively fast-track his learning. If he does not use the pad, keep the puppy with you on a leash to prevent accidents, or confine him and try again in 10 to 20 minutes. Soon he’ll begin to go to the pad on his own, and look to you for approval. You can also encourage elimination outdoors in your yard and on short walks. Just take your puppy to a chosen spot on grass or mulch and use your consistent phrase while you hold the leash. Give lots of praise for success. As your puppy grows into an adult, he may opt to eliminate outside most of the time, but keep PAW TRAX Doggy Pads handy for traveling or when bad weather makes confinement a necessity. Social interaction with other dogs offers valuable life lessons for puppies. Before hitting the dog park where big dogs romp, try finding a friend or neighbor with a puppy or a tolerant adult dog. Beware of bringing your puppy directly into another dog’s home or yard, which is perceived as territory. A short leash walk outside together is a good way to introduce two dogs of any age. Your puppy can follow the other dog or puppy and enjoy companionship without being suddenly thrown together. Once your puppy shows confidence meeting other dogs, try the dog park. Spend at least 10 minutes on the outskirts at first and let your puppy just watch. As dogs come and go with their owners, check your pup’s reaction as they pass. If they meet nose-to-nose, see what happens when the other dog moves on with his owner. If your puppy wants to follow, he’s ready to go into the park. Don’t be upset if the other dogs rush over and your puppy is momentarily frozen. 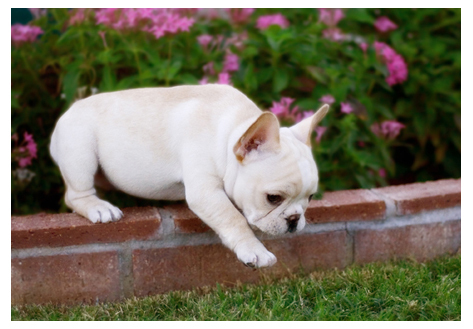 Once the established dogs move away, your puppy should get up to follow them. Try to resist the urge to pick your puppy up. It’s easy to be the over-protective pet parent, but let him tumble and get dirty with his new friends. Dogs often pair up to play. Look for signals that show that each dog seems equal and one is not always trying to get away. Elbows down and rear end up is an irresistible invitation to play. If your pup finds a BFF, try to coordinate your dog park visits so they can see each other regularly. Keep your dog park visits brief as two or three times per week are more than enough. Your vet can tell you when your puppy is fully protected by vaccinations and ready for the park. Whether you have a young puppy or adult dog, keep in mind that the canine mind needs stimulation. A light training session once per day will bond you together more than couch cuddles. Be patient and keep sessions brief for best results. Playtime is often just as powerful a reward as a treat. Your dog is very good at reading your moods and emotions, so pick a time to train when you are feeling good. End sessions on a successful note and your dog will look forward to the next one. Dogs want to be with us more than anything else. After a hard day at work, give your dog some quality time, and he’ll pay you back more than you can imagine.